Tux the dog, who stole our hearts after his Friday morning appearance on "Today in LA," has found a forever home. 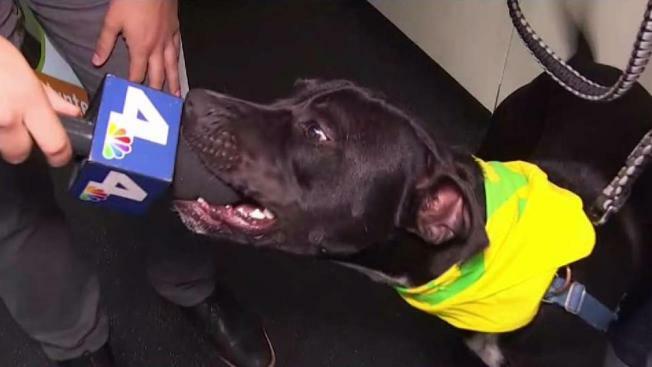 The large black dog first captured our attention when NBC Los Angeles reporter Jonathan Gonzalez asked him for a sound byte early Friday morning. Tux responded with a bite of his own, and snagged the wind screen off Gonzalez's microphone. On Saturday, Tux was recognized as "the dog that bit the microphone" and cheered after he walked out of the Pasadena Humane Society sporting a red bandana on a leash held by his new owner. "I saw him on the website, and I thought, I loved how he looked because he's black and his chest is super cute," his new owner said. "And then I saw him on the Instagram of the Pasadena Humane Society, and then I saw how he bit off the microphone, I thought it was the cutest thing ever." She said she thinks she'll keep his name, but will have to think about it. "I'm happy that I'm taking him home," she said. Tux is one of more than 50,000 pets adopted from more than 900 shelters across the nation in the NBC- and Telemundo-owned television stations' third-annual Clear the Shelters drive, which wraps up Saturday.